I have used Amazon forever and happen to be an Amazon Prime Customer, so why the Hell does this retarded app tell me my Password is incorrect? Who knows? It is complete crap! Maybe the divorce screwed up the app too!! I’ve paid my hard earned money for a 200,000 VC digital code card. They took the money off my card but now they’re telling me it was a problem wit my order. When I hit the ‘Prime’ next to ‘Wholefoods’, it just gives an error message. This thing does nothing I can’t do with the browser and inundates me with “helpful suggestions” of useless amazon garbage. What can you expect from a company whose only real claims to fame are borderline slavery and having a contract with ups? Needs an update so it will load quicker. No need to sit and wait for it to load. I love this app, and this store. The only problem is that I am 12 years old and this is restricted to 17 and up. I think this should be changed. Why can’t children shop? This needs to be fixed and I think it should be fixed fast. On iPhone give away part doesn’t work like it did. When you tap on the box it doesn’t scroll back to the top to tell you the status and then when you hit the back arrow it takes you to the top of the giveaway and not where you left off. Why can’t I buy amazon prime and movies tv shows on iOS mobile I don’t have a computer and I like the app than the website. The app is very slow and glitchy, takes long time to open, and bloated with many questionable “features” like voice search and such. Please try to get the basics right first, Amazon, then add features. There is a lot of junky ads and “sponsored content”, which makes it difficult to search for the staff you want and generally annoys. I used to love Amazon, now I am treating it as a trip to a dentist: painful, not fun, but sometimes unavoidable. More and more of my shopping goes elsewhere. App does not return same search results as using website. Makes me feel like they are pushing certain products/vendors on app. How dare you put a toilet seat with a picture of our lord and savior & his mother on it!😡 But you won’t sell the rebel flag in fear of offending someone. I’m one guy that always gets what he wants and I promise you, I will delete my prime account and never order from you again. And on top of that I will pray to god that your business collapses everyday until it does! I’m not somebody you wanna mess with trust me. I’ve got the power of GOD on my side. I’m not sure if it’s the latest update that causes the app to crash but for whatever reason, my searches won’t load completely on my phone now. I didn’t have this issue before the update. It tells me to refresh my search or it’s checking the store room. It’s really annoying when you are searching for items or scrolling through the fetched items from your search. The text size is way too big on iPad Pro. Give me options to adjust. So,I love Amazon. My mom & I constantly buy from them but lately we’ve noticed some items that we've ordered seems as if they're from Wish (another platform that sells really cheap & low quality). The packing is the same & comes from the same place, & the quality of most is cheap. Just wanted to let Amazon know to see if they can investigate their sellers & from where they get the merchandise. Just updated, app will not do anything. Can’t view items or review orders. Not the VPN’s fault. Will take my business to Walmart, I guess. I am a loyal customer to Amazon, they go over and beyond customer service. I have always loved purchasing items online, but now I have to due to a neck & spine injury. I have not one complaint nor recommendation. Amazon is run extremely well. If you search for a kindle book that costs money it opens in the app instead of the browser then says you can’t buy it in the app. Not only is the app crap it breaks web searches for books Truly sad. I love amazon but it should be seamless, and easier to move items from “Saved from later” to lists. Also if you could move more than one at a time! 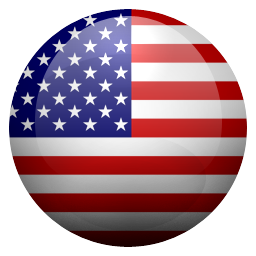 I have been very disappointed when purchasing items and discovering, AFTER PAYING, my item is being shipping from China or India or other very distant locations and it will be weeks in the process. Please find a way to let us know this up front so we can decide whether we can wait that long. The app by itself works fine, but when I try to view any of the videos/advertisements for an item, it brings up a black screen with a crossed out play sign. Reinstalling didn’t help. There is no information out there who to contact to resolve issue. 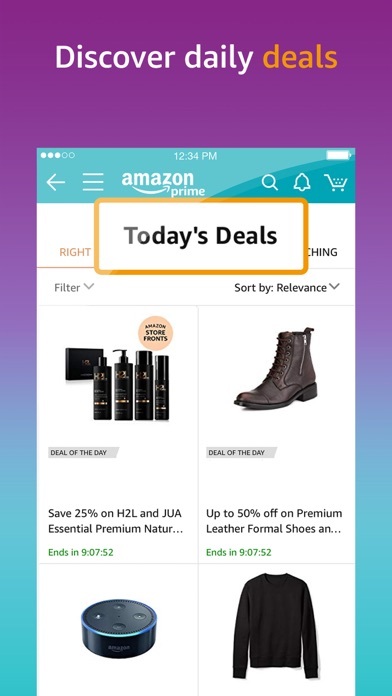 This app is useless for a lot of things I do on the Amazon site. There are broken links, filtering is minimal, and half the time it works one day and doesn’t the next. They’ve obviously scraped the bottom of the barrel when allocating resources for app development. It’s a shame. App is fine, but the customer service around Amazon Logistics is bad. I had a time sensitive gift and they misplaced it. Escalated support said they would make sure it arrived that day or they would send a replacement via Prime Now. Three calls and a discussion with the "leadership team" and they couldn't/wouldn't do anything about it. I was lied two at least twice. Lost an hour on the phone and gift was now late. So slow as to make you want to walk to Walmart. If you use a vpn it gets even worse. Not exactly a good advertisement for their cloud computing work( the dog food tastes real bad). The app doesn’t go back to where you just were after you enter a giveaway, it jumps to the beginning of the list. Terrible… so annoying! 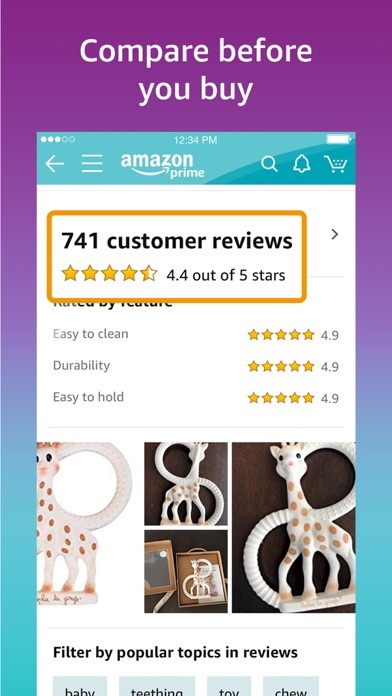 App works well enough but there sadly is no apparent way to adjust the size of text or ability to even at the very least zoom in on selections of text, either in the item descriptions or in the section with the tiniest of text, the item review area. Extremely disappointing. I recently ordered baby products for my daughter’s baby shower and I loved it. It came on time as always. I mistakenly pushed to I DONT NEED IT ANYMORE. We got the baby monitor and we love it. I WILL NOT be sending it back. Seriously? More ads? I’m unhappy. I’m also unhappy that the option to click for more results is gone. I used that to find deals. You’d think a multi-billion company would invest in putting together an adequate functioning app. let alone investing in hiring PROFESSIONAL and experienced customer service representatives. It seems like the customer service reps are not in house, cannot understand nor write basic/proper English, and are very rude. Please invest in your customer service! Everything I need I get from amazon and it comes next day or the day after and I don’t have to worry about anything getting lost! I love It! Don’t purchase from third party sellers! Everything is right at your fingertips. I input a gift card into my account and every time I try to spend it they decline my order. I’ve called them 4 times already regarding the issue and they just disregard it. They don’t care about the consumer. I don’t recommend using Amazon unless you want them to steal your money. It’s a good shopping app that works well but... it needs a dark mode. Does Amazon know how many customers window shop from their bed? Dark mode. Please. It’s funny that when you have a bad comment about a product Amezon don’t accept your comment. I order a product, that never showed up after two weeks. Even tho I did get my money back I feel like it was just fair to other customers that a leave a comment about the product. Don’t believe all the reviews they never accept the negative reviews about a product..
Just got this app and I can already see there is more selection and seems to have better quality products then other apps I’ve used. Amazon still can’t bother to spend resources to allows the Amazon app to share an iPad split screen. Paid extra for shipping advertising that it would be here by sat. ordered on a Thursday very dissatisfied. This app is great except when it comes time to look at orders for budgeting or confirming charges to a bank account or credit card. I want to see how much each order cost at a glance so I can easily know which charge on my card belongs to which item. I’d also like to be able to search orders that were part of a subscribe and save deal only. Every item listing screen is different. For example, the “share” button is always in a different spot. Sometimes it’s the word “share” other times just the icon and other times both. It’s sometimes above the listing or below it, or not even present. Same for Other elements on the screen, they’re all over the place. Can you standardize the item listing screen? Also on some screens the “left edge swipe” works to go “back” while on other screens it doesn’t, and on some screens it opens a side menu instead of scrolling back. 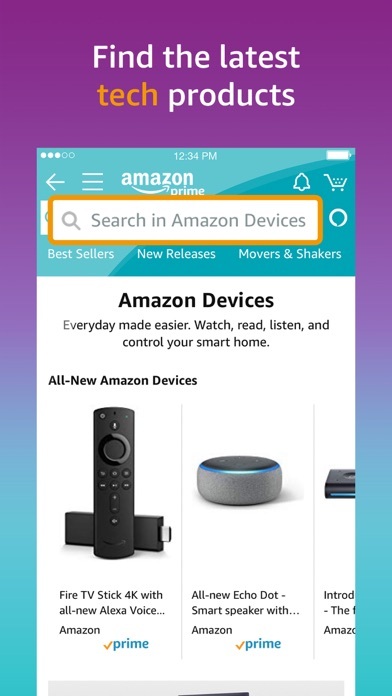 Please standardize the movement controls in this and all other Amazon apps (especially the Alexa app which is worse than this one) Finally, a bug to report: when searching my previous orders and I try to type an item, the search box disappears while typing and the keyboard remains active. When I press enter, it just reloads the screen and doesn’t attempt searching for typed item. Thanks. I’ll buy things when I want to. I prefer to use notifications for things like packages arriving. I do NOT want to know that you found some junk for me to buy. I do not like the the large format list view. I liked the grid view and suddenly the app no longer has that setting. 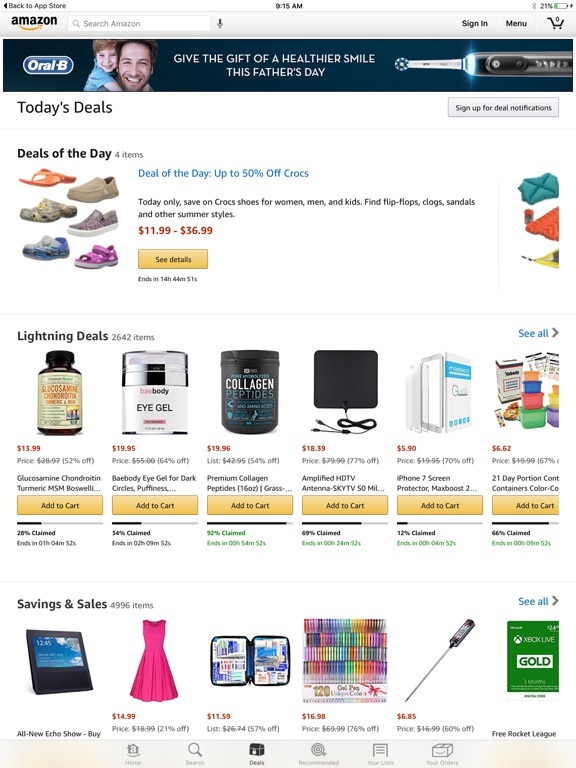 I'm on Amazon daily and the list view is so time consuming and there is so much white space. I don't like it at all. I registered a new account with amazon with the attempt to buy a gift card essentially I wanted to use my gift card to buy an xbox live card after attempting to do so my account was placed under suspension with no reason given, then ultimately I was told my account was closed and I would not be refunded my money. I called customer service multiple times and the technicians never got back to me or when they did they alleged claims that were far from the truth stating that my account was connected to another that was previously suspended which I am not connected to after months of looking for answers they send me an email with a link to a policy about gift card transactions and that you can not by a gift card with another gift card and at this point I was more understanding, but just for kicks I went through and did some research I found accounts with upwards of $600 had been cancelled or suspended with the money never being refunded, and when you go to look at the terms and conditions menu the information is not readily available in the slightest. Browsing for a product is now impossible; they literally took out the feature. Searching brings up a bunch of “renewed” products even when I add terms like “new” or -renewed. Also their ratings are all from bots. The app showed my order as delivered but I never received anything. Amazon refunded my money in less than two days. 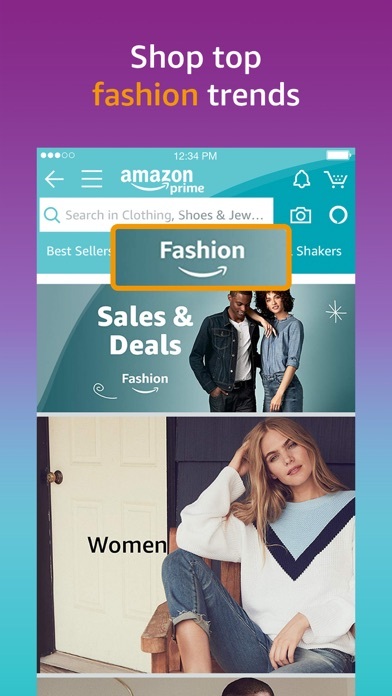 Amazon links from other apps open the Amazon app but don't open the product page. Of course pasting the link in the search bar, even if it contains the item name, results in no matches but you knew that already because Amazon search is, and always had been, utter garbage anyways. Whu So S L O W Lately?? I usually love this app. I can’t remember the last time I shopped Amazon on my computer! But for several months now (so I know it’s not just a temporary slow wifi thing) every time I search it’s so agonizingly slow! The results are a little draggy but when I click on a product, that takes forever. Then anything I want to do within that item— reviews, even adding to my cart.. Well I wished I had packed a lunch. Plz developers, speed this app up!! never get my packet contact customer service so many times and don’t help, never get any refund, keep ask me to check my bank statement, i check and keep asking me to check, and there was just no refund and didn’t get my items too. whatever just waste that few dollars and never gonna buy stuffs on amazon again! Would love to be able to order through the amazon smile program but this app or no app that I found enables you to order through the smile program. Twice I have ordered Off here And My Packages Came Late.!! And I Also Have Amazon Prime SMH.!!!! I’m Still Wanting For My Package And It Was Supposed To Be Here Yesterday And On My Order Before This One They Had 4 days To Get My Package Here And It Was Still A Day Late.!!!! What’s up with this guys? This is hella annoying. Please enable Touch ID to open app! Please consider updating the app to open using Touch ID. Right now once I am signed in to the Amazon app, if someone were to steal my phone they could shop to their hearts content on my dime! I don’t want to have to log out every time I use the app just to protect myself! The biometric option right now does not even work if I have to sign in! I would give the app 5 stars if they would integrate the ability to order through the SMILE program or offer a separate AmazonSMILE app. Every time I refresh I get wildly different recommendations that have no basis in reality. There is now no way to be notified of Dash button orders without also being spammed of updates to the shopping list. Sometimes you can track your order. Sometimes not. Sometimes there’s shipping information. It’s a complete roll of the dice. Things get bumped from your cart randomly (not out of stock or for any particular reason). And if you’re very unlucky, they will charge your card three separate times for the same amount in a 15 minute window. The chat is not useful, as it just cycles through prompts and the newest person never actually reads the conversation in order to help. Worst guarantee delivery service ever. They make false promises for guarantee delivery. If i have to wait for my product on a guarantee delivery option than i would rather buy it from ebay for cheaper price. So disappointed!!! There is no option to purchase e-books. 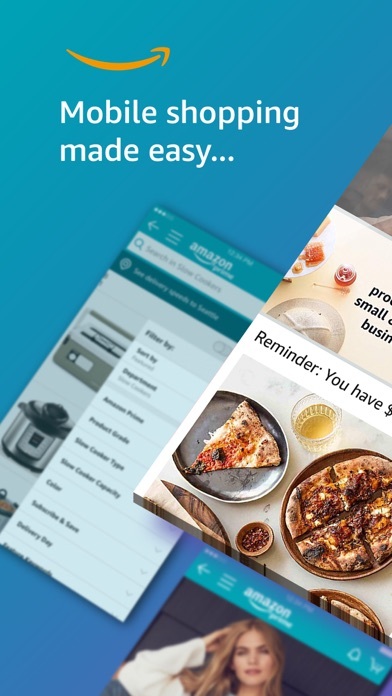 Kindle is one of Amazon’s biggest selling point, that is the main reason most individuals get this app in the first place, otherwise they could easily make purchases via the main website. Unless of course you’re an avid shopaholic and use everything about Amazon and do not read or may not know how (In that case, this post is not for you). Any-who, book consumers must rely on the desktop version to conduct business. Downloading the app is supposed to make things more convenient and it only adds more of an inconvenience. This app seems to have a hidden agenda to only allow the purchase of paper backs (which cost more) which is unsatisfactory. I challenge you to use this app and search for any book and deselect the paper back version and only go for the kindle version and watch what it does. Of course I am referring to ver. 13.7.0 (1-241872.0) in the event they finally fix this then disregard but until then, shame on you Amazon mobile app developers. What is wrong with the search engine? Package 📦 left at the wrong house. I just realized that the package 📦 wasn’t delivered to my house. It was delivered to a vacant house two doors down from me two days ago. I checked to see if it was there but, did not see it. Over the last few months, the quality of Amazon service has really taken a drop. Not only do my packages regularly get delivered to the wrong address but now I’m receiving the wrong items in packages, even after returning the item that was wrong in the first place. All I see in the Amazon top line of suggestions for my interests are things I have no interests in? I look at specific things everyday. Those similar items typically show up in the page. No more....it’s all strange stuff or things I might have looked at years ago. No way to print my invoice from my phone. Very frustrating. Company refused to do anything about their screwup. Bought an item that guarantees everything would be in the box. Someone at the warehouse removed an item that cost over $200. I'll start by saying I understand why this probably exists-my phone is a bit older, so I think that's a fair enough point to make considering the problem very well may just go away if they sit on it long enough. That said, this phone still keeps up with a number of other apps that load up and display what should be much more burdensome content. The only explanations I can offer would be poor optimization, a bug that causes an overflow on older devices but muscles through/times out and continues on stronger phones, or else the app just crashes because of something that happens at launch or because the data collection is a bit too aggressive. Curiously, the app works correctly when launched from a browser instead of from the home screen. When it does work, the app keeps up pretty well with their reputation for user experience, though I'd personally put product reviews up higher because I research everything I buy online. I haven't actually bought anything through the app, I've mostly used it(when it works) to browse in the fairly small amount of time I've had it, but for what I am shopping for it's a lot less complicated to just use a different shopping app, like Newegg, to find stuff that may interest me. The font is a complete eyesore considering nearly all other highly visited sites/apps (and my entire phone!) use straight arial-derived fonts. I genuinely thought this was a bug when I first saw it and tried to fix it. I know it’s something to get used to, but please at least format it correctly. There’s inconsistencies in which the old font is still shown for certain text. Some of the text will have improper spacing, making it look like a jumbled mess on item pages. The whole look of it reminds me of shady independent websites that you’re hesitant to trust your money with. Please consider changing it or giving us the option to change it. There’s also no way to zoom in on customer review images now. It was buggy before but now it’s just gone? It’s helpful to be able to look more closely at the images to decide whether I should purchase the item. I never had a problem with this app until the most recent update. All of a sudden, I can't tap on an image to view it in full screen mode, no matter what I tried. Completely closed the app, restarted & tried again - no good. Completely closed all apps running on my iPad, did a full power down & restart, then opened this app & tried again - no good. Finally deleted the app & reinstalled it, picked a random item & tried to view the image in full screen. Yay! Success! NOT!!! Why? Because after that, everything else I tried to view in full screen brought up the image of the first item, (a cat toy), I'd successfully viewed that way! So, like I said, what the heck?! Update: Downloaded the new update and this annoying glitch still isn't fixed. It's even gotten a little worse, since uninstalling & reinstalling is only good for one full screen viewing. Once you restart the app, you can't get a full screen view. My patience is wearing thin. Let me start by saying I used to absolutely ADORE this app. However, in the last few updates everything has gone to hell in a hand basket. Adding items to the cart? Works just fine. Purchasing said items in cart? Nope. No can do. Every time I click on the place order button, it acts like it’s processing the order then just reverts back to my cart with the items still in it. The only way I can purchase anything is if I use the one click option. Also, the app will randomly ask me for my password when I have been logged in and using the app for some time and then tell me its wrong. Yet nothing changes except I have to force close the app and start all over because it's stuck in this stupid password glitch. Same thing happens whenever I try to look at anything with my account. It will ask for a password and tell me it’s wrong or that an error occurred and make me force close. Search feature brings back incorrect results when Im logged in with my account. When I try to search for a particular item and I am logged in to my account the search results are way off the mark. If I log out and search again for the same item I get the correct items in the search as well as the correct prices. This is also happening in the iPad. If I want to see the correct results I have to go through suggested items or sponsored items or items that I have previously bought and then search from there without using the search bar so the results are accurate. If I do not do this and go directly to the search bar the results to come back are incorrect. To the extent where the names of the items are wrong and the prices are way higher than if I search the item through sponsored or related results. I like the app. Very user friendly in general. No issue so far. I actually have a suggestion, not for the app but for the buying experience. It would be good to be able to update the amount for the monthly payments. When you choose the monthly payment option for an item, there is no way to update this option in order to pay in less months. I bought this item that had a 5 months payment plan and I wanted to pay it in two months according to my financial previsions. The suggestion I got from the customer service was to pay at checkout and call to pay the rest as a one time payment. And I get that this is because there is no feature yet allowing us to update. So it would be great to have one. Thanks. I miss having the search option in wishlists. The update before the more recent one brought it back but the most recent one took it away. Also there is issues sometimes when I look at reviews and try to select most recent. The page will stay blank when I try to select one and it won’t let me choose most recent. If you don’t bring the search back maybe you could add a wishlist option for ordering items in alphabetical order. A few updates later and I’m still not able to search through my wishlists. Things were so much easier to order and find when I could search that way! I can’t use control F on my computer because sometimes every single page in your list doesn’t load. I used to use the wish list tray constantly because it was the fastest shortcut to get back to items I was considering for purchase. Now I have to go to the menu, lists, pick a list, and then scroll them full screen. Before I could just us the tray to quickly compare multiple products by just tapping from one to the other in the tray. Now I have to drag something I don’t want into the tray to get it to appear, only to have it disappear as soon as I look at a product. It takes me 10 times as long to shop now, and honestly I’ve just about stopped using the app altogether since they ruined my favorite feature. Come on guys, phones are huge now, I don’t need the extra 40 pixels of real estate. Give me the ability to toggle tray behavior in settings, or I’m done. It must be ok cause I buy a ton of stuff on this app. 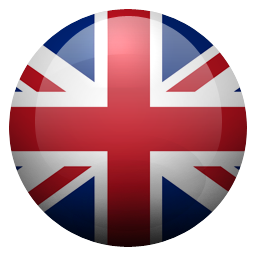 But yeah it is lacking some important options that the web site has such as different choices. An annoying thing it does is when you are looking through the deals of the day it often times loses your place. You will be way down the list, click on an item to see it, then click back to the list, only to have it zoom you way back to the top of the list. Yep many times that has been when I just say “ok, I guess that means I’m just done looking for deals”. And close the app. But otherwise it works great on my iPhone XR. Hint: if you are not using the iPhone X or up you are practically living in the dark ages. Give up your silly iPhone SE and join modern times. This latest version seems like it has introduced some very pesky flaws. First issue is when I open the app, start typing into the search window and the letters are not showing up as I type them. Example if I’m trying to search for “generator” and after typing “generator” into the window, It used to automatically fill in as I type but now it misses the “ge” part of the word and the word “nerator” is showing in the search window. Obviously there is nothing called a “nerator” so it doesn’t show any search results. The other issue I (and others I know) are having is when you have an order in shipped status, the tracking link shows up for a split second and just goes blank, if you go back and hit the update link a second time it is fine but this is annoying. 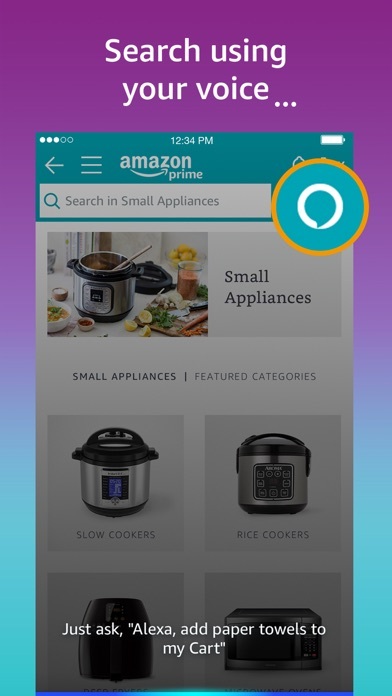 I use the app a lot, and it’s great for shopping, but I get frustrated because of the combination of no forward button and slow response. If I have gone to several screens looking for something, and want to go back one screen, I hit the back button. Because of slow response, it looks like I miss-hit the back button. I instinctively hit it again and I am returned back to the beginning screen of the session. I cannot forward back, so I am forced to try to recreate my previous searches. Ugh. If no forward button, I need an instant indication that back is actually in progress so I won’t be tempted to hit back again. Or, stop going back to the beginning with two presses of back. I’ve used your app since you ever had an app! Never ever had issues! Because of that I give 4 stars. It worked a couple weeks back but been having problems the last two weeks. I can search and look up items as normal but when I click on one of the thumb links to read details about a product or buy a product. It’s a blank white screen that dimly flashes. (White and grey)?? I restarted my phone and everything else I think to do on my part. Nothing works. I understand it may also be problems with current bugs on iOS 11? Either way. If this isn’t just me, I can see it seriously being a problem. Anyway, Thank you, and everyone have a Happy New Year! I love this app for the on-the-go use; using my phone instead of having to be at a desktop. However, there are many features that seem to not appear anymore. For example, when multiple items ship together - clicking on “orders” shows you the individual items. Once you click an item that shipped with others, it sometimes says “+2 more” (or however many extra items). You used to be able to click that to see what other items were in that shipment. 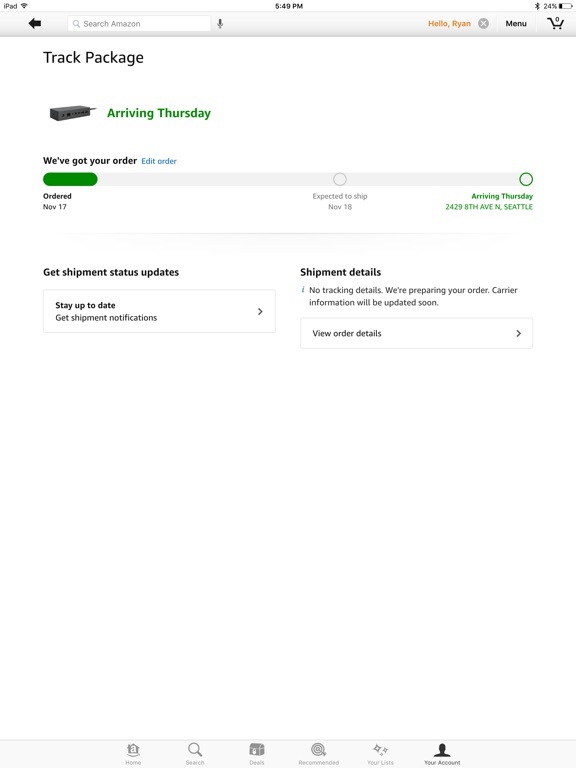 I’m trying to track when certain items will get to me, but I can’t see what shipped with what, therefore leaving me unable to know when I can expect those items. It’s frustrating because it’s something so small that I used so often, but know it’s gone. I don’t understand why this happens but if you have old payment information, your item will not be purchased or shipped and the app will not notify you. Also even if you update your payment, you have to delete all other previous payment card or else your order won’t be processed. Also the app will register that your item has been purchased but will not be updated until later. Extremely frustrating when using your 1- click button only for the item not to be bought when I look at my orders tab. I have been cheated on overnight shipping two times already because the app will not select my new payment information. Maybe have the app select your most recent or previous payment. 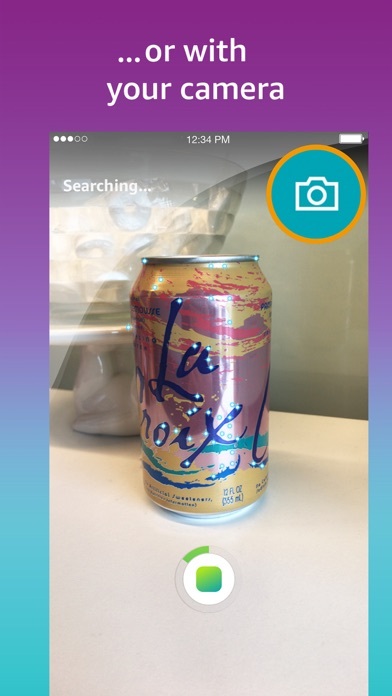 I don’t know if the bug was introduced in an earlier version or what, but it’s annoying how searching for an item always fails when you first launch the app. 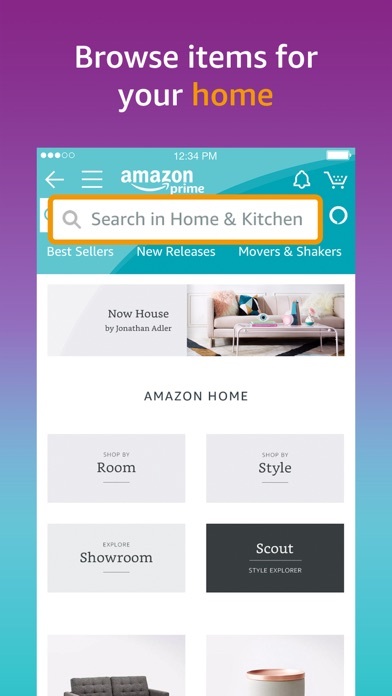 It always takes you to their ad, such as for Echo dot, and when you go back to the search field, it doesn’t even recognize your search as a previous search so you have to start over. In addition to that, the annoying introduction of the delivery location right below the search field seems to interfere with searches, as well. If you try to select the top search result, it seems to think you’ve selected the Delivery section which is “underneath” the top result. I think the same thing might be happening with the bug first mentioned above, where hitting the Return or Search results brings up the “featured product” instead of the actual search. I use this all the time on an iPad and iPhone because I have Prime. Problems I’ve noticed on the iPhone & iPad are while reading reviews you will keep reading repeat reviews because it loops back & you’ll question your sanity as well as waste your time. Another, on the iPad app you can’t see customer photos which makes reviews less helpful, but you can see them on the iPhone, so I have to open up my iPhone if I really want to see customer photos. It’s been a long time and I’ve updated these apps many times, but never an improvement to those issues. I would love this app if you could fix those bugs. I also don’t care for the item drop wishlist, I find it more annoying that I have to click it away after accidentally pressing something for too long. Why pay $100 a year for 2-day shipping when it’s a gamble whether or not you actually receive 2-day shipping? If it’s not going to ship in the amount of time that you pay for, why not just disclose that! I am incredibly irritated, as I ordered something Thursday only because the app claimed it would be here yesterday. I NEEDED a broken piece of my breast pump for work today. If I had known it wouldn’t arrive till the FOLLOWING WEEK (even though the item advertised WILL ARRIVE BY SATURDAY), I would have just spent the extra money and bought it at the store when I had the chance. However, I had no updates saying the order would be late. I returned home last night with no order and the tracking says it won’t arrive till next week. I am currently at work in a lot of pain because my pump will not work without it. See if I pay for my membership next time around! Over the past 2 years the app has lost search features, one by one. It appears to be an intentional pattern vs. severe oversight or poor planning. Can no longer sort by ratings or amount and see all products within the already poor refined group. The app will preselect specific results - I assume those merchants that have paid them extra to do so. Without the newest problem noted above, the search terms are bringing up results that are not related to what you’ve typed into the search bar. Example: type in paper mache box - you will get a glass lid for a pot. WHY? If you specify a specific vendor, you will still get a dozen additional vendors mixed into the results. WHY? If you search by department you will frequently see results that should not be under the department or sub department. Example: you can be searching in groceries and find clothes in the search results. Please start enforcing some quality control in these areas. I have chosen to not purchase items advertised under the wrong category or have wrong photos. I have also started shopping more on other websites, in search of one that has better controls in place. Glad finally gave the iPad app some love. But now you need to update the iPad screenshots. The dated screenshots are uncharacteristic of Amazon’s usual attention to detail. ‘Swipe Right’ [to go back to the previous page in the app] does not work after you drill down into ‘Description’ or ‘Features & details’ sections of a product page. It seems to correctly on from other pages. Please fix this issue on these pages. Also it would be great if you could swipe down on the enlarged product photos to return to the main product page; similar to how swiping down on a photo in the iOS Photos app allows you to return to the Album View. Sometimes simplicity makes a big difference! 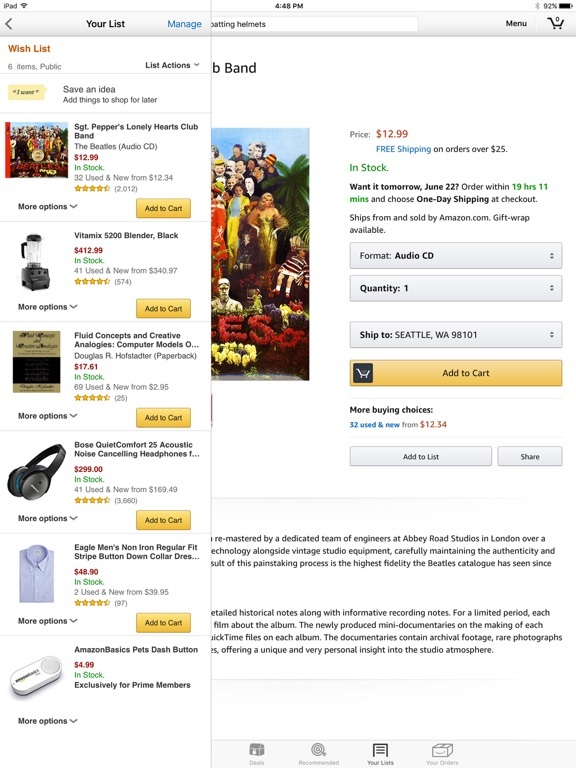 On a computer or a large tablet with a larger page, some of the suggestions or history might be fine but when I’m on my little iPhone making a quick purchase, all I want is the ability to search for products and prices, add to my “shopping cart” and check out. 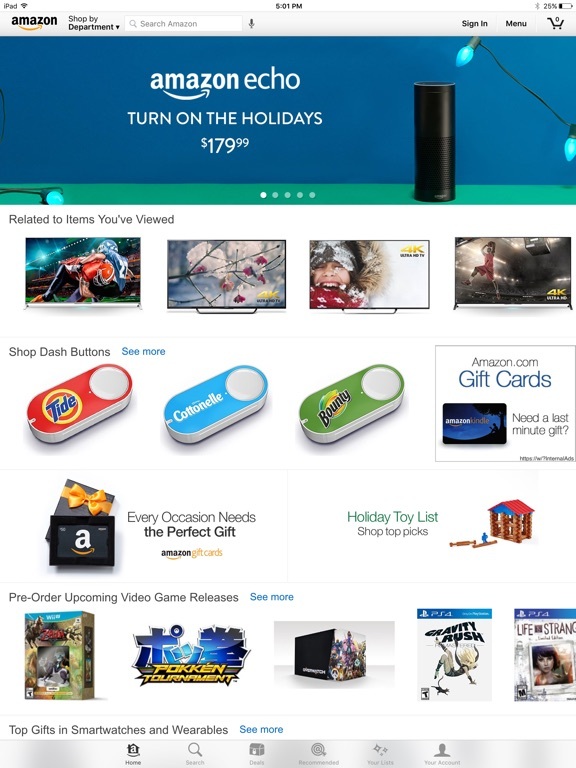 Things like lines of history and a collection of dash buttons are a horribly obnoxious waste of my time and have on occasion made the shopping experience confusing enough for me to close the app and look for the same product on google, Walmart or another app or web site. My time is too valuable to waste on superfluous web and app gadgets! Please fix your app or provide a simpler version for sensible shoppers with limited time! 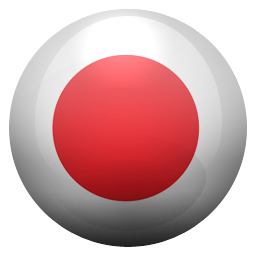 I have used this app frequently with few glitches or problems. I loved the freedom it provided since I primarily use my iPad for day to day use. Sadly though after the latest “update” the landscape mode seems to have vanished. This is a major problem for this consumer because I only use my iPad in landscape mode. I sincerely hope that the developers are speedy in the remedy of this extremely inconvenient glitch! Update! The glitch was fixed in short order and the app is back to full use! Thank you so much for you quick attention to such a small but very annoying issue! I used this app for a couple of years and had no problems until I’ve recently made purchases and my account gets locked. I thought I forgot the password and went through the reset process, but I can’t access my account because of security reasons, very confused on how and why my account is locked. I put in my billing and address in, I’ve confirmed that everything is mine months ago. Once I get my account locked I have to do everything again, and wait additional days to confirm its mine again. I’ve made purchases that was as cheap as $25, but when I try to buy my college textbooks which is about $100 or more, this is when the problems occur. This app is frustrating and problematic. If I go into my wish lists and try to order something for me or friends, first it doesn’t recognize my login and says there’s an error. I can go out if it and hit the list again and it comes up. If I put items from my friends wish lists in my phone to purchase and hit proceed to checkout, it asks for the shipping address but will never go past that page. I have to go to my desktop to order the items. Talk about irritating! My Touch ID won’t work to sign in either. I have an iPhone 7 and this started before the 8 came out. I have all of the latest iPhone updates and the app is up to date. This has been going on for weeks! This REALLY needs to be fixed! Putting that annoying wish list bar and stealing my screen real estate is dispicable. It also breaks some top menu stuff and video play on products. It basically locks the app at times. And your latest "update" shows how clueless you are. Fix the top menu freeze caused by the wishlist space stealer or remove the space stealer? I don't want it there but I can't turn it off? You say you want to be cutting edge customer focus? Get rid of that stupid wish list. Wish list is for others to look at, not me, and not constantly. If I delete everything on my wish list does it go away? Going to try that next time I swallow my bile enough to open this app. This annoying app that now I have to restart again and again because the wish list bar locks it up. Did you ever stop to consider that we hide menus under the hamburger menu for a reason? Because most of the time we don't interface with the wishlist or the blah or the blah. It helps reduce cognitive load. This is not good user interface or user experience. You need to seriously question the motives and intelligence of the person who championed this "feature" and foisted it upon us. You should also remove that bottom bar. Like other reviewers I have been unable to make purchases from my app. I could add items to my cart, but when it was time to check out it would require me to input my password. And after submitting my password, I would receive a “something went wrong” error message. This has occurred over the past several months. So today I deleted and reinstalled the app, and was able to conduct business as usual. No problems whatsoever. This is a great app, but it can be frustrating if the above occurs. Therefore, delete and reinstall, and all will be better. Search Feature Only Pulls Up Promo Items?!!? I don’t know what happened, if it’s some bug with my new iphone X, but now when I go to search for something, it won’t let me select from the top several most closely matched search term suggestions, and then one it does let me select from doesn’t actually pull up that item, but rather some totally unrelated crap from their lightning or promo area that’s not remotely what I want. For example, I typed in “bean bag” and it pulled up some deal on a fishing reel. “Picture hook” got me a Fire tablet. I also can’t use the button in the upper right area to change between my lists. Many functions in the upper area of the screen appear to not work off and on. Tried deleting and reinstalling. No change. Way too frustrating, please fix!!! Where do I start? The layout is clunky and requires an extra step in the drop down menu to go anywhere off of the home page, & you can’t enlarge by tapping pictures anymore- it’s a pain in the neck to have to zoom in and out instead of a quick tap. But my biggest complaint is that on the deals page I can’t choose a size or color- when I tap the arrow, it “blinks” but doesn’t give a drop down for a choice. In other words, if you have to make any choices before ordering, you might as well forget it. Haven’t tried on the other pages yet, but if they are the same it needs to be fixed if you want any orders! Very disappointed- I shop using this app frequently, but will stop if it’s too frustrating to use. Why do things not get delivered sometimes? It’s stupid! I have to say something before I start this, this has to be one of a must NOT have instead, like that time when my brother tried to order something, it said it would come either 4-5 days but when the day it was supposed to come. Guess what, It DIDN’T arrive to our apartment! True story. That was in 2015. Anyway, I’d like to ask why and how does this happen? Cause yes. Like I said that is stupid because I thought that we would always get the proper items at the exact day it said. But hopefully that will fix in the future. In order to make this a five-star review, we need to see more Account Settings and Preference options in the My Account button, as well as some major scrolling issues fixed in the product details pages (I’m using iPad Pro 12.9”). 9 times out of 10, when I go to buy clothes or things with many options to choose from, the drop-down menu only shows what it can contain in the preset menu size. There is often a slight movement to indicate more options below, but it snaps back to the first view. I buy shoes that are size 11 and it only shows me size X-9.5, and I can’t get down to 11 to order. Not cool. Yes, I’ve tried portrait and landscape mode and neither work. 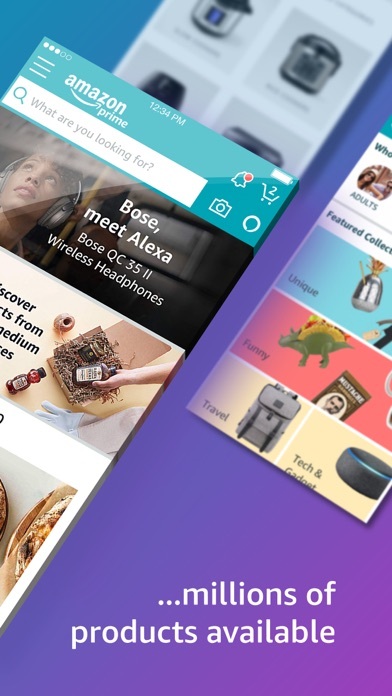 This is the best shopping app. I have prime and it is completely worth it. There are times when I order something at 2pm and it arrives the next day for free. They also have the best customer service I’ve ever dealt with. The customer is always right, reps are friendly and knowledgeable and the few times I had to call, I always hung up feeling beyond satisfied. They use the post office for shipping and you can track you package directly on the app. They also do real time updates in case there will be a delay on post office end. Best app overall. Application works fine for me. Wish it was easier to save items that I have contemplated purchasing without adding to cart. One thing that is extremely disappointing is meeting community guidelines to rate a product that was purchased. I don’t buy a lot and didn’t meet criteria to rate the product. I feel that if I buy something, rating it is a given. Another way to strong-arm people into spending more. The reality is I was going to give it an outstanding rating and talk very positive about the product purchase. So you and the seller lose out on a good review. It also took the ratings and stars down on the app review as well. You should consider changing this. Current version won’t allow me to click “View all lists” from my main wishlist, so I can’t look at my husband’s wishlist to get him something. It’s like there’s a dead spot on the screen where my finger won’t register. I was worried that it may be my phone (now old 5S), but other apps will register my touch in that same spot. I had no problems with functionality prior to this update. *Update* The problem seems to be the wishlist tray at the bottom of the screen. As soon as I hide it, the entire screen works again. I added an item to my wishlist and the wishlist tray popped back up, then suddenly none of the top row buttons were working. Once I hid the tray again, everything returned to normal. 2 Day Shipping for Prime members is B.S. Let me first say that I have been a long time Prime member and like the convenience of the range of products available. I also loved the fact that 2 day shipping actually took 2 days. Recently, today in fact, I’m in the mountains on a camping trip. I ordered a camera to capture the memories from the trip. This order was on Wednesday and guaranteed by Friday and was to be delivered to the campground. It’s now Saturday and my package is set to arrive at the campground that I will be leaving on Sunday a day after I leave on Monday. What a hassle. I have to make arrangement s to have the packaged shipped to my house taking more time and money. This is not the first time for being burned on guaranteed 2 day shipping. Going to start using Walmart app as they actually have 2 day shipping at no additional price. The app updates are making it slower to use. Scrolling down used to be smooth but now is a pain to do. The app keeps refreshing a lot. Sometimes the page goes blank or takes a while to load. I have to close the app and try again. Also on checkout, the total cost of my purchases are not shown anymore. It doesn’t include the fees and shipping which I would like to know beforehand before proceeding to check out. I always have to guess or estimate the cost overall. Oh and when I sign up to be notified about when an item is in stock, I never receive any notifications for it. And those community polls are annoying too. Don’t really like this new layout. Update: Newest update brought landscape mode back. Really disappointed that the last update took away landscape mode on my iPad. I use a keyboard case so my iPad is in landscape mode the majority of the time. This update makes it inconvenient for me to use the app. There doesn't seem to be anywhere to submit questions or comments to the developers. I'd like to know if this was intentional or if it's a bug that will be fixed in a future update. If it was intentional I will uninstall and go back to doing my shopping at local brick and mortar stores. Used to be awesome till comments and reviews for products got corrupted. I’m writing this because since a couple of updates back, the comment and reviews for products have been messed up. Simply put for example, you search for an airplane, you pick your product from the search results, click on the reviews and comments for said product, and you get reviews and comments for a BOAT. A completely unrelated product. Don’t know if it’s just affecting me or others, but it’s extremely annoying because product reviews are VERY helpful and instrumental in making an informed purchase. Please fix. Everything else is fine though. The way lists are set is very crappy and too difficult. It’s not fun having to drag the item to the bottom to have it placed in another list and have to tap on it to move. All of the lists should appear so you can select where you want it and when you tap on lists from the side menu, all the lists should appear unopened because then you’d have to tap at the top “view lists”. It’s simple, literally social media has it down better and they aren’t even shopping apps. They give you all your created lists to choose from for putting an item you like in. Use to work perfect, not so much anymore. For months now, I’ve noticed a few buttons that would not work, i.e. the back button when looking at photos. I’ve waited patiently hoping these would get resolved, but instead, the app is getting worse. There are more buttons and functions that just don’t work. The wish list tray doesn’t load everything I have in my lists. So I try going into the “your lists” tab but I cannot switch between my lists because the “see lists” doesn’t do anything, so it does me no good. Many times as I try to search, it takes me to the Alexa page instead. Restarting the app never resolved any of these issues. I will probably just not use the app anymore. Ehh.. new update messed everything up. It was perfectly fine until the latest update. Or, at least, I think that’s the problem. It’s not showing the prices for items when I search? I have to tap on them to get prices which is extremely frustrating and makes it impossible to browse. It wasn’t doing this a week ago but now everything is out of whack! It isn’t letting me filter only prime items, either. Instead of having a nifty little button right under the search bar, I have to go into the filters and add it there. I’ve never had a problem with it before so I can only assume some update occurred and that would be the cause of all my problems here. Generally I love the app, but just wanted to point out that there’s some sort of glitch that disables the top buttons on the page (back, cart, etc.). It’s frustrating because if you go to read the extended item description, you can’t go back to the main page. You have to either close the app, or click something lower on the page (if possible - if you’re in the item description, closing the app is the only option). I’ve totally lost a few items I was interested in. Generally the app is good, and I know the problem will be fixed soon. For now, though, it’s too annoying to shop. I’m furious it’s become so difficult to contact sellers. That’s shady business, you are trying to make things difficult for buyers and I don’t appreciate it. I don’t want my personal items blaring out for others to see when I open the app. My parents saw very private personal items and gift items they should not have. Things that can not be unseen. Things that should never, ever under any circumstance under the sun have ever been on my opening page of the app. It’s disgraceful that you don’t respect my privacy. I’m reconsidering the amount of business I’ve been doing with this company. The developers have intentionally made the app more difficult and miserable to use. At this point I’d rather go to Walmart. Don’t get too big for your britches. I tried this a couple of years ago - and deleted it because it was pretty useless as it wouldn’t let me buy anything at all. (Yes I was logged in). It would search - but not allow me to buy. So wind forward two years and I thought surely they’d fixed by now and so I downloaded it again - and there’s still a similar problem; I can now buy certain items e.g coffee but this app doesn’t allow you to buy books on Kindle - it only allows you to get a free sample. (Yes I am logged in and no I’m not the only person I’ve spoken to with this problem, it seems very common). So a good idea, and some improvement - but overall poor in execution and not tested before being released. I prefer to log into the website from my phone.